I needed an antidote to the overdose of carbs and calories I consumed this weekend. So I had a simple dish of roasted vegetables for supper this evening. Roasted veggies are a great way of incorporating the recommended five a day servings of fruit and vegetables into your daily diet; making them is simplicity itself. I am sure you have your own version. Here’s how I made mine. The quantities I used are enough for one as a main course or two as a side dish. I chopped up a courgettes, a sweet potato and a red pepper. I tossed the diced vegetables in extra virgin olive oil and sesame seeds. I added three unpeeled cloves of garlic and sprinkled Maldon sea salt on top. I popped them in the oven at 180 degrees. After half an hour I added half a red onion thinly sliced and a chopped Portobello mushroom. It took a further half hour before everything was properly cooked. That’s a whole hour, however the cooking time will vary from oven to oven. Fifteen minutes before the hour was up I added a handful of samphire. Lastly before eating, I removed the garlic cloves and squeezed out the now very soft insides and mixed them back in with everything else. 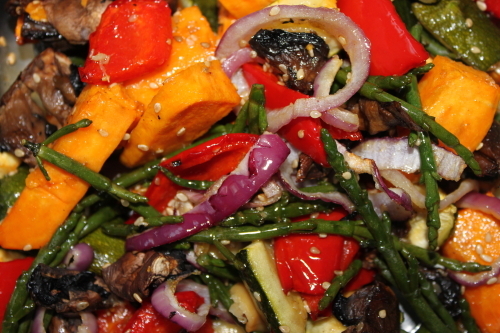 I ate my roasted vegetables with heaps of Marks & Spenser’s hummus. Yum.